Big-hearted company specialising in automotive and household products, Winplus Europe, has launched an exciting partnership with CLIC Sargent, the UK’s leading charity for children and young people with cancer. 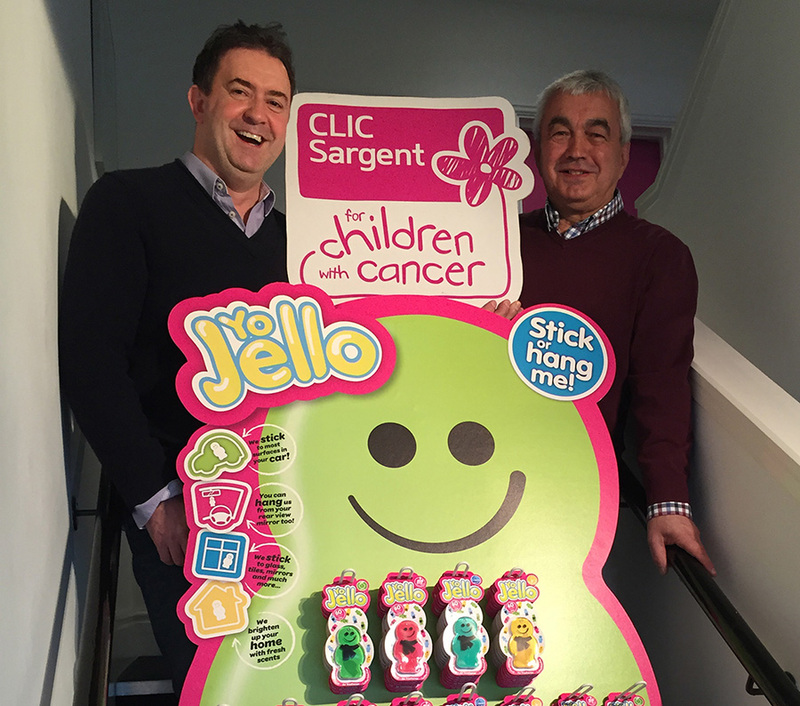 The launch of a colourful new website specifically for the sale of YoJello air fresheners will mark the beginning of a new partnership between the Haverhill-based company and the charity which provides clinical practical, financial and emotional support to children and young people with cancer. Wishing to give something back to CLIC Sargent following the support received by his family when his grandson was diagnosed with acute lymphoblastic leukaemia, Managing Director of Winplus Europe, John Kegg, and GQ Design Creative Director Craige Quainton decided to think differently and give something back by donating a percentage of profits from the web based sales of the brightly coloured, family-friendly air fresheners program. Driven by a desire to create a product which not only smelled good but was also fun to look at and more importantly, safe for the whole family, Winplus together with their creative partners Saffron Walden based GQ Design created the self-adhesive, jelly figures which can be stuck, placed or hung from most surfaces in the home, office or car. John said of this innovative product; GQ did a fantastic job in creating and designing such a fun product. Its young styling has the perfect image for our new partnership with CLIC Sargent. The personality of this fun character is contagious and as a result we’re hoping for great sales which in turn will result in increased donations to help these kids and their families. Now with a growing family of fun characters to choose from, 50p from the sale of every YoJello air freshener up to a maximum of £2 will be donated to CLIC Sargent via the Yo Jello website. John says of the new partnership “ having experienced first hand the care CLIC Sargent provides after some discussion we decided this was the best way to give something back and we hope the partnership will grow and grow”. Local fundraising Manager for CLIC Sargent, Daisy Turner said “We are delighted to be supported by Winplus Europe and are so grateful for their support through the sale of these distinctive air fresheners. If you’d like to know more about YoJello and how to purchase YoJello air fresheners you can visit the website www.yojello.com.